Let’s start this week with a very interesting article about Chinese scientists editing the genomes of human embryos. There has been a lot of debate about whether this should be tried out or not, and it was inevitable that someone did try it out. The current experiment has failed, but it is only a matter of time that they succeed. In somewhat related news, scientists have completed sequencing the whole genome of the woolly mammoth. Actually bringing back an extinct species is still some time away, but it seems like the expert opinion on the issue is that it can be done. It seems like the government is working on making the idle gold lying in temples and with public to work, will be a good thing if it actually works. Amazon is always trying new delivery methods, this one is quite novel as well – delivery in the trunk of your car. Buy your kid a domain name – does actually sound like a great idea. British Indian votes crucial in UK election. Finally, there are many good lessons to learn from our bigger neighbor but perhaps the lesson to hire strippers at funerals is best avoided. Mumbai’s Postal Department has recently launched a new website www.sukanyaaccountmumbai.in for the investors in the Mumbai region to guide and help them open accounts under its most popular scheme Sukanya Samriddhi Yojana. This website provides all kind of information about this scheme, including its salient features, frequently asked questions (FAQs), application form for account opening and most importantly, the “Sukanya Samriddhi Calculator”. List of Post Offices – The website also carries a list of 417 post offices located in Mumbai along with their complete addresses and respective contact numbers (landline). You can now contact any of these post offices nearest to your place and talk to the concerned officer directly regarding any features of this scheme. Toll-Free Number – Mumbai post has also taken the initiative to start providing info regarding the scheme and also resolving investors’ queries on its customer care toll-free number 1800-223-060. You can now dial this toll-free no. and have your queries resolved regarding Sukanya scheme. Call Back Facility – They have gone one step forward by introducing the call back facility as well, in which you need to provide your name, e-mail id, contact number and PIN code and they will call you back and provide all the necessary information. Facebook Page – Mumbai Post has also created a dedicated facebook page for this scheme, namely Sukanya Samriddhi Account Mumbai Postal Region. At a time when most of the banks are just not ready to provide any info regarding this scheme, all these initiatives are really appreciable. What impressed me the most is the availability of the excel-based calculator on this website. I did not expect such a move by a postal department in such a short period of time. I really appreciate such proactive steps taken by the Mumbai postal department. This calculator calculates for you the expected maturity value that you’ll get after 21 years based on your annual or monthly contributions. You can check the maturity values based on your variable contributions as well. 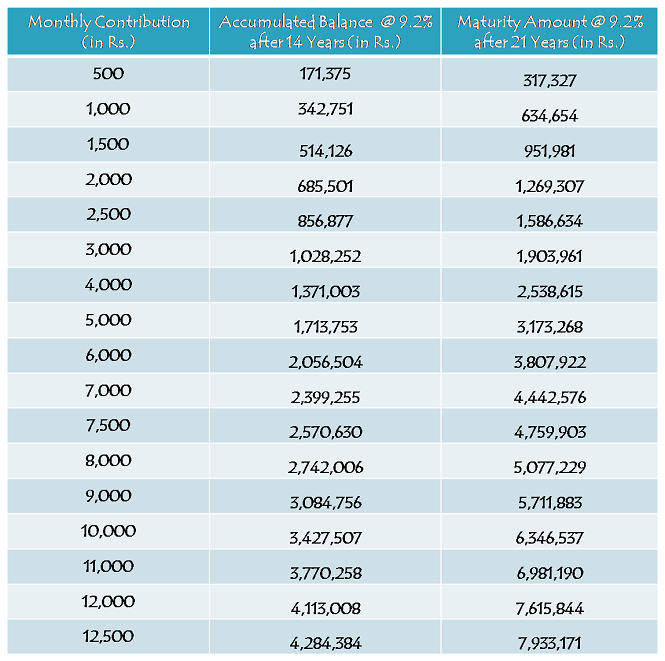 You can get an idea about the maturity values from the below pasted tables as well based on your annual or monthly contributions and a constant rate of interest of 9.2%. So, I think the investors in the Mumbai region now should not feel helpless as the Mumbai postal department has done a wonderful job by providing all kind of information about this scheme on its website and also by launching a toll-free number for handling investors’ queries.